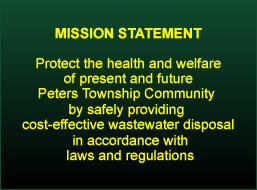 The Peters Township Sanitary Authority, located in Washington County, Pennsylvania, is a municipal corporation organized under the provision of the Municipal Authorities Act of 1945 as amended. The Sanitary Authority was incorporated by the Township on March 20, 1964, for the purpose of providing and maintaining a sanitary sewer collection, conveyance, and treatment systems for the western portion of Peters Township. A second Authority, the Peters Creek Sanitary Authority, serves the eastern portion. The Sanitary Authority’s corporate life is extended until August 1, 2050. The system provides service to approximately 6,000 customers. The sewerage facilities are comprised of two treatment plants; the Brush Run Water Pollution Control Plant (BR WPCP) and the Donaldson Crossroads Water Pollution Control Plant (DC WPCP), eight pumping stations, and approximately 130 miles of sewer.